We enjoyed some great times on our latest skate date. Short boards like the quinboards Mini-Me (Length 75cm, Width 23cm, Wheelbase: 39cm) give you maneuverability and the Mellow Drive gives you extra power. Combine these two and spots that were tough to ride become easy as pie. We took this set-up to the infamous Hamburg ditch for a dirty, but very fun ride. The massive +20% banks were easy to climb and the whole place was turned into an oversized skatepark! 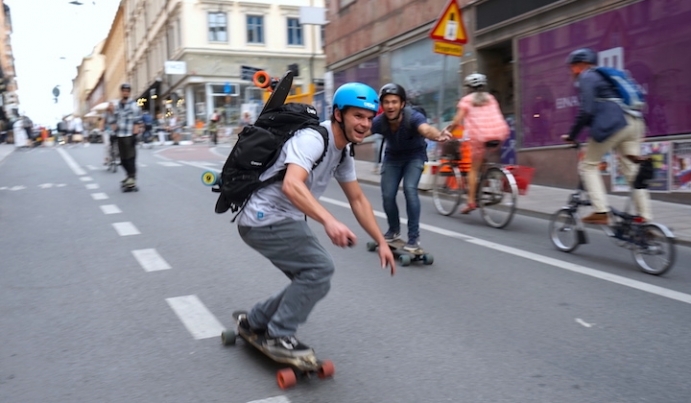 Check out this other blog for other cool Hamburg spots to e-skate. The German drive is quite compatible with this Cologne-made Mini-me board. Good thing the Mellow drive is compact because this board is small! These two got along well right from the start. A standard mount and enough room for the Drive even with a small wheelbase of 39cm. It's a small but powerful ride so you be ready to deal with a little extra thrust under your feet in spite of the reduced space topside of the grip tape. If you got big feet, you might find it hard to really stretch your toes and relax. Otherwise the board feels good. The nice kicktail and short wheelbase makes the board sweet for pivoting in tight places like crowded sidewalks while still letting you go wild in spots like the ditch. It doesn't have enough deck to really flex and get your carving going but you can loosen the trucks to get a bit more swerve in your ride. Like we said before, high speeds can be a bit daunting, but if you are used to short boards you shouldn't be too stressed. If you want to step it up to Pro Mode, keep your trucks tight, place your back foot above the screws instead of the kicktail and let the juice loose! This board is truely for the e-skater that has a skateboarding frame of mind and still wants keep it freestyle with wheelies, pop up a little curb and roll off a sidewalk. It is also perfect for someone that is looking for a board that is more of a low speed city crusier to enjoy some Mellow sidewalk shredding. A smart board to bring along if you travel since it is light and takes little space on the subway or in your suitcase. We're happy this board let us ride the ditch like we have never had been able to before and we are looking forward to our next session with the Mini-me! If you want to hook up this quinboards Mini-Me deck to your Mellow, order yours here. Not convinced that you’ve found the perfect mate with the Mini-me? Be sure to subscribe to our Melow Times newsletter to be advised of more fiery hot matches.